Tower 3, 1st Floor!! Newly Remodeled!! FREE BEACH CHAIRS!! THIS IS THE CLOSEST 2 BDR UNIT TO THE LAGOON POOL!!! ALL NEW ULTRA MODERN LIVING ROOM FURNITURE WITH A NEW 60' FLAT SCREEN TV!!! ALSO ALL NEW BEDDING, LINENS AND BEDS IN SECOND BEDROOM! FREE WIFI COMES WITH THIS UNIT!! NEW FLAT SCREEN TV'S WITH DVD'S IN ALL ROOMS!! NEW BALCONY FURNITURE!! NEW PAINT THROUGHOUT!! NEW MEMORY FOAM MATTRESS IN MASTER!! FULLY HANDICAPPED ACCESSIBLE SHOWER IN MASTER!! Don't wait for elevators! 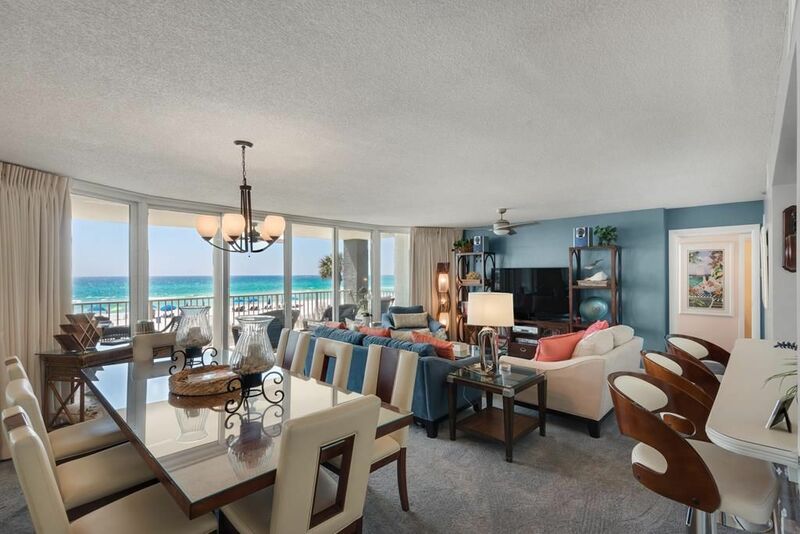 The warm Florida sun and cool ocean breezes await you at this beautiful, first floor condo at Long Beach Resort, one of the nicest and most exclusive resorts in Panama City Beach! This condo has a new owner who is really making this unit look great!! Wall to wall oceanfront views from every room of this spacious 1400 square foot paradise, and with the location of this resort, it is convenient to everything from great restaurants to a Super Walmart right across the street! Large lagoon pool (6800 square feet) with waterfalls, whirlpool spas, two Polynesian pools (seasonally heated), onsite bar and grill(seasonal), beautifully landscaped grounds,and jet ski/umbrella rental on site as well as 24 hour gated access and security. The living room has a new 60-inch flat screen TV with DVD and queen-size sleeper sofa. There is a King-size bed in the master with new flat screen/dvd and two new queen beds/mattresses with new flat screen/dvd in the guest bedroom along with a queen sleeper sofa in the living room. New linens/towels in this condo, all beds have 300 count Egyptian cotton sheets! There is a custom designed full-size shower stall with a seat, safety rails, and Waterpik shower head in the master bathroom. Both bathrooms have double marble vanities and the guest bathroom has a large marble garden tub. The living/dining area and both bedrooms open onto the spacious balcony with all new furniture overlooking 1300 feet of private, white sandy beach. This is a NON-SMOKING unit, Pets NOT Allowed, and Renter must be 25 or older. A beautiful and well stocked condo. The decor was excellent and high nd. The only downside was the AC. The bedrooms were hot and I even had to buy two box fans. The living room/kitchen were super cool. When we first got there the smell was terrible! I don't know if someone before us cooked something fishy or what but it did eventually fade. The condo was very nice and well maintained. The master bed was a little too hard for my liking but everything else was very nice. Really like to balcony furniture very comfortable. What a beautiful place. This condo did not disappoint. Had everything stated and more! It literally had anything we could possibly need for a weeks stay. The room was extra clean and we loved the location. I wasn't ready to leave and am already ready to book our next vacation with Kims condos. Highly recommended! Great Resort and a great time. We loved this condo and it really deserves 5 stars, but there are just a few things keeping me from giving a perfect grade. 1. There is no way to lock the front door from the inside to keep small children from escaping. 2. The basement door to the stairs closest to this room is not always opened. 3. One of the beds in the guest room is so hard it is difficult to sleep on. These were all minor things that won’t prevent us from coming back, BUT I would love to come back to a nice lock on the door so my toddler can’t get out unnoticed. I was in tower 3 /103 for a week in may. New owners had just renovated the entire condo. It was beautiful! There was new paint, new bedding, new patio furniture. It was clean with a well appointed kitchen. We couldn't have asked for anything more. Looking forward to my next booking! Add 13.1% tax, $100 cleaning fee, $39 accidental damage insurance and $4 per parking pass (2 cars max). Holidays and special events may be higher than posted rates.